The sub genre called Disaster movie had its "Golden era" during the 1970s with movies like The Poseidon Adventure (1972), Earthquake (1974) and The Towering Inferno (1974) – also Airport from 1969 can be included. The attraction of disasters has continued in the 2000s with new technological resources in the hands of the filmmakers. It is of course possible to go further back in time and the first wave of disaster films came in the 1930s. San Francisco (1936) is often regarded as the first disaster movie. Here is the catastrophic event the 1906 earthquake in San Francisco. Among other older movies worth mentioning in this sub genre are In Old Chicago (1937) that is set against the Great Chicago Fire in 1871 and The Rains Come (1939) with a flood destroying the Indian city of Ranchipur. In the examples taken from the “The first wave” the catastrophe is the climax of the movie and not in the center of the story. In the later disaster films the story would often have the disaster in focus. One film that doesn't incorporate this model is Airport (1969), but it shares one aspect that will be seen in the typical disaster film in the 1970s and that is the large character staff that are (or will be) linked to each other by the catastrophe. Airport is a melodrama that almost excludes the action in ambition to build its characters – still it can be placed in the discussed sub genre because the (latent) disaster is the thing that binds the characters and forming the plot. Gene Hackman as Reverend Frank Scott leads the survivors inside SS Poseidon. Some years later The Poseidon Adventure becomes a well deserved major box office hit. The ship SS Poseidon travels from New York to Athens but are overturned by a tsunami. This literally turns the ship upside down and the most of the movie is filmed this way. In the year 1974 came two star-cast disaster movies: The Towering Inferno and Earthquake. The Towering Inferno had the biggest stars with Steve McQueen, Paul Newman and Faye Dunaway among many other well-known actors. A fire starts after the electrical system breaks down in a 138 story skyscraper with a big party in one of the top floors. The movie became a success and won three Oscars. The movie Earthquake was another evidence of the cinema attraction about disasters. The film centers on a fictional earthquake occurring in Los Angeles. Walter Russell who works as seismology realize that a major earthquake can hit the big city and his belief in a catastrophic scenario is really happening. Bad news arrives to the football stadium in Black Sunday. In 1977 came the nerve-racking Black Sunday as a contribution to the disaster movie genre in the shape of a political thriller. A Palestinian terrorist group is planning an attack against the Super Bowl X event with 80 000 people in the audience. FBI and Israeli agents collaborate in stopping the attack, but seems to be one step behind. The year before had the movie Two-Minute Warning almost entirely taken place at a sports stadium and with a sniper prepared to do some damage (although some big names like Charlton Heston and John Cassavetes this is however a movie that is deservingly less known). 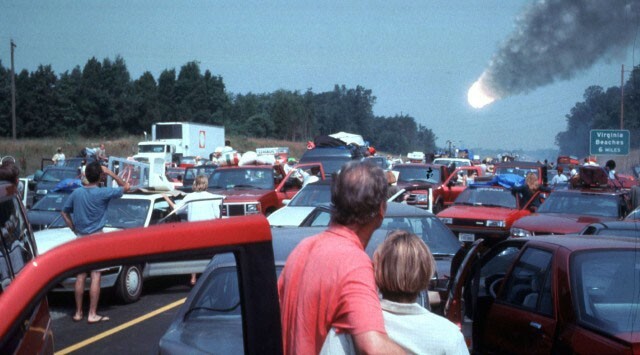 In the middle of 1990s the disasters begins to return to cinema. Some are linked to natural disasters like Twister (1996) and Dante’s Peak (1997) – tornado and volcano. But the disasters would become bigger when before and threatening the whole civilization in movies like Armageddon (1998) and Deep Impact (1998). The trend with disaster movies with tremendous catastrophes would continue into the 2000s and the digital technology would bring even more spectacular examples. But beside the special effects movies like 2012 (2009) and World War Z (2013) would lack in form of other qualities. Besides the technological development the movies have also absorbed contemporary issues like climate changes contemporary issues like climate changes in The Day After Tomorrow (2004). An attempt to show the catastrophe from another perspective was done in the horrifying Cloverfield (2008), a movie that didn't use the typical large ensemble, but instead a small group and the form was taken from the horror genre not the melodrama. It is of course possible to give the disaster epithet to tons of movies. The Black Knight Rise (2012) could be called a disaster film if we counted the explosions and the damage done to the city of Gotham. The aspects of disaster could also be brought up for movies like Waterworld (1995) or King Kong (1998), but both these movies are better categorized as action or adventure. This is also the case in movies like Independence Day (1996) or War of the Worlds (2005) that primarily can be put in the science fiction genre. Another movie that can be mention is Titanic (2007) which better fall into the category of a romantic drama. The list of excluded movies with factors of catastrophes could of course be much longer.